Today we took Luis back to his family. He had been on the streets of Maputo for a few months. He is one of the sweetest most respectful boys at Masana. I never heard anyone say anything bad about him or things he had done. His family is in a rural area near Maputo. We took a ferry across the bay and then a chapa (local mini bus) to his house. We walked the last 15 minutes to his house. All along the way, neighbors would call out, "Luis" as we passed by. They were all so excited to see him back!!! Luis had left home a few months ago after getting into some trouble with some of his neighbors. He and some friends had stolen a chicken from a neighbor and eaten it. For whatever reason, Luis decided to run away rather than be punished. We had a good talk with him about being careful about the friends he chose to spend his time with. We'll return to visit Luis in a few weeks. At that time, we'll take him clothes, blankets, and a few other basic necessities. We'll also help him start up a small business. He and his mom are talking about the possibility of starting a chicken business where they raise chickens both for eggs and to sale. I am really excited about this possibility as it is a business that can keep its self running as long as the chicken's are taken care of. We're going to do some investigating on the start up cost of this. If its not way out of our normal budget I think it could be a great one to try out! And Luis can replace the chicken he stole from his neighbor!!! Please be praying for Luis in these next few days as he readjusts to life at home. Pray that he may be overwhelmed by the love of his family and neighbors. Pray also that he will find a church near his house that he can get connected to. Another son is back home tonight!!! From time to time, we get some visitors at the Kunhymela House. Some come for a couple of nights and some stay for a couple of months. Since late July, we've had Corey, a university student from Oregon, staying with us. He is really gifted in carpentry and has completed a few projects for us around the house including some more beds. One of the street boys, Paito, has become Corey's assistant. Its such a blessing when a visitor is able to teach the boys something valuable like carpentry. Thanks Corey for taking time to teach Paito....you may think of him as just someone to assist you with your projects but the time that you are investing in him is helping him to see the value he has in God's eyes. And that's our purpose in being here in Mozambique with these precious boys. A few weeks ago, we did our first follow up visit with Fabiao. If you haven't read about his reintegration yet, you should check out that post. It was the most joyful reintegration yet!!! After a great time celebrating with this family, we made the 3 hour drive back to Maputo. We will be back in Xai Xai, where Fabiao lives in a couple of weeks which means we'll get to visit again! It is always a blessing being a part of seeing families restored! 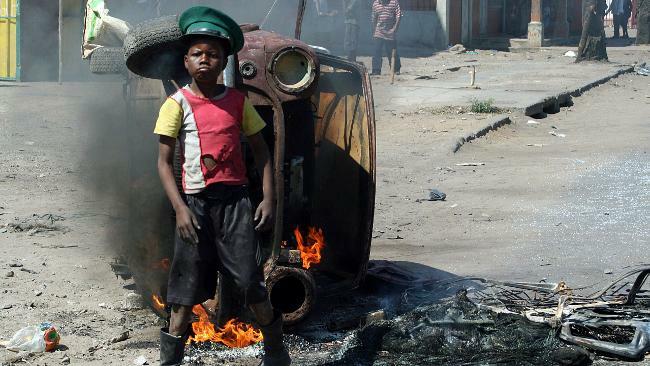 A little over a week ago, Maputo experienced 3 days of rioting as the people protested the increases in the price of electricity, water, and many basic food items. One street over from our house was one of the worst areas on the first day of rioting. For hours, the sky was black with smoke from burning tires. Police fired tear gas and rubber bullets to control the crowds. Cars were destroyed. Shops were luted. 2 innocent children lost their lives. Despite the commotion on the street, our house was a place of peace. We had 24 street boys with us that day. They were grateful for a safe place to pass the day, safe from the danger on the streets. I was blessed to see them here rather than out participating in the riots. What a joy to provide a safe place for these boys. In response to the rioting, the government found ways to help with the cost of living by supplementing bakeries so that the price of bread could remain the same and lowing the taxes on importing goods from other countries. Thank you everyone who prayed for us during the riots.